Seventeen stories above Kansas — above cement rivers and man-made surf waves and cups of Dippin' Dots: The Ice Cream of the Future; above America's Potemkin beach, the water park — the ride designer was talking to the governor. They were standing atop Verrückt, the tallest waterslide in the world. "Feel the shaking tower?" Jeff Henry, the designer, asked. Sam Brownback, the governor, said, "I thought it felt like it was a little …"
The designer had a slightly wild look in his eyes. Without the slide, you might have thought Brownback was introducing an aggrieved rancher fighting the feds over grazing rights. Travel Channel cameras were shadowing Henry for a documentary. "I'm not really a designer anymore," he told Brownback. "I'm an actor." Before Brownback could reply, Henry added, "I'm not as good as you, though, governor." "I don't think I'm as good as you." Brownback let the jab land and laughed. "It's going to be a great attraction," he said. "Gotta love it," Henry said. Waterslide designers compete in a parallel-universe version of The Right Stuff, vying for height and speed records because — this can be the only reason — it seems like a really awesome thing to do. Of these men, Jeff Henry is the most brilliant. He has the ability to make humans not only go down waterslides but upthem, in the manner previously possible only on roller coasters. More than one of his employees compares him to Steve Jobs. 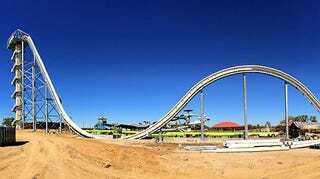 Kansas City&apos;s Verrückt Water Slide Is Insane (Literally)!